From time to time, the dog owners observe that their loving dog is not taking proper diet as he consumes usually. If you find that the food of your dog is not appropriate, then it may be due to various factors like illness, new surroundings or has become the picky eater. 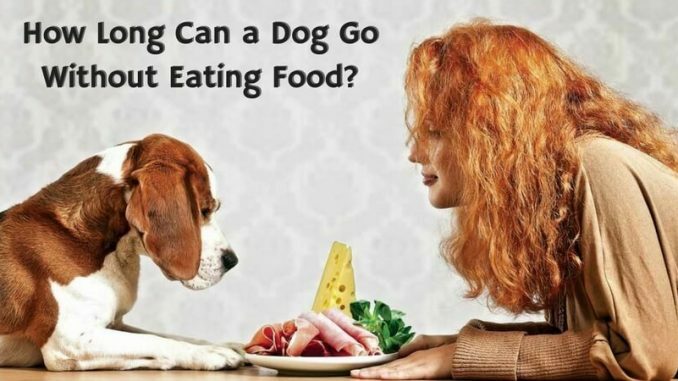 Whatever might be the reason but if your pooch has inadequate diet then no need to worry at all as in this post I will let you know how long can a dog go without eating. There is not accurate figure to justify that your four-legged friend can go deprived of eating. Many factors are measured to know about the consumption of food by the dog. The intake of the diet depends on the breed, age, and health of the dog. By and large, it is considered that doggie can live on without food for 3-5 days or maybe for a week. There are different assumptions on this point. Some predict that the pooch can live for a month devoid of proper nutrition. It has been observed that adult dogs can’t stay for the longer time without food as compare to puppies. The physically fit pooch can live without food for the longer time in comparison to canines that are in poor health conditions. As a caretaker, you should not only be concerned about your pet’s diet but also keep the record of your dog’s intake of water. It is the sensitive issue to ponder that how long can dogs go without water. Each day the consumption of water is essential for your valued pet. In case if he skips any day then make sure it is a severe sign for which you have to consult a vet immediately. Water is the must for your pooch which will save him from dehydration. More amount of nutrition is required by the younger dog as compare to older canine. So you can make out that intake of nutrients depends on the age of the dog. The energetic dog consumes more nutrients. So if you possess active pooch, then you have to arrange right quantity of nutrients for him so that he can live comfortably. The more massive dog needs a significant amount of food so they can’t live without food for the longer time. The dog who is suffering from health issues or sensitivities can’t stay without food for the longer time. Make sure that the consumption of water for your pooch should be more frequent than the food. In hot weather, your beloved pet can’t live comfortably without water. In case you face an issue that your pooch is not feeling like to have food, then it may be due to the health issue for which medical aid is required by the vet. You can change the menu of your dog’s food if he is not eating correctly to make sure that he is not bored with the regular list. Offer him some treats which will motivate him to consume diet. In case you tried your best to make your pooch eat proper food then also he is not consuming correctly then take the help of the vet who will diagnose the issue. How long can a dog go without eating or food depends on age, breed, size, health condition and activity level of your faithful friend. If one dog can stay fortnight without food, then the other can remain only for a week. You have to vigilant to notice the dietary intake of your pet. By reading this post you can gather information regarding how long your pet can survive without food and water. Proper love and care will make your pet stay smooth and pleasurable in your family.